Highly visible mailing / handling & shipping labels / stickers in a variety of styles and sizes. Our mailing labels / parcel handling / shipping labels have a permanent adhesive and are supplied on rolls for ease of use. Easily peel and stick the labels onto your boxes, cartons, envelopes and packages to alert handlers to the how contents should be handled to avoid damage to your goods. 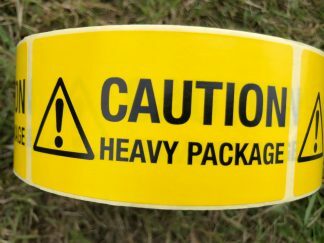 A full range of parcel / shipping warning labels for suitable for most postage / shipping / courier / mailing applications. If you do not see the design of label you are looking for, please contact our sales team on 01332 865933 as we are able to print any label that you require in both small or large quatities.